ONE REASON FOR SKYPE'S continual growth is its strong position as a utility. And nothing makes something a dead-simple utility than a resemblance to a standard household item (like a phone). That's what Skype is for me. It fits in my pocket (see left) and it rings on my home DECT phone. During the last quarter, Skype’s registered users grew 41 percent to 521 million people. That means 10 times the population of Ireland became registered users of Skype during the summer. Revenues grew 29 percent to $185 million. Free Skype-to-Skype minutes grew 74 percent to 27.7 billion minutes. I was one of the consumers who paid for SkypeOut minutes, a section of Skype revenue that grew 44 percent to 3.1 billion minutes and paid the company $185m in revenues, up 29 percent from a year ago. If the current Skype trend line continues on its current slope, it could mean one billion dollars in annual revenue in early 2011. Skype shown running on Nokia N97. Figures from Marketwatch, 21 Oct 09. EUAN SEMPLE'S LAW: "If you squelch all noise, you ain't got no signal." The law arises after considering Leo Laporte’s observation on Net@Night and TWiT when Leo observed that YouTube has ten hours of video uploaded every minute of every day. He then quoted Theodore Strurgeon who claimed that “80% of everything is crap”. Euan and Leo gave this some thought, concluding if 99% of everything is crap, a very viable one per cent of all video generated for the internet is totally excellent. When you consider that six minutes of excellent video has been uploaded in the time you've spent reading this blog post, you're stuck realising that you'll never be able to watch all the totally excellent video minutes being uploaded for free view on the internet. Screenshot from the totally excellent Vodspot template. Euan Semple -- "80% of everything is crap" on his blog, 21 Oct 09. ANOTHER HALLOWEEN and another night of yellow-lighted roadway outside my home. It's overhead lighting from National Roads Authority fixtures that ensure road traffic outside can accelerate to 50 mph before leaving the built-up area. There's really no other reason to erect motorway-style lighting if you don't intend people to think the road surface invites steady acceleration. We used to live in Ballyclerihan, just outside Clonmel, where the yellow lights were confined to a ribbon on the main road and where you could see the stars outside our home. Because it was so dark inside the home, one 60-watt electric bulb really looked like 100 candles. Not here in our current home. Yellow light bleeds into the place and that actually creates another effect--we can actually move around the house without turning on any lights. All we have to do is remember to keep a few drapes split wide enough to let a sliver of light pour inside. Image from Gregory Crewdson's "Beneath the Roses", an exhibition that took three years to create, requiring the sort of production team usually reserved for a film. IRELAND LOOKS SET TO abandon the most most critical paradigm to Irish economic success as a December 2009 budget imposes several constraints on teacher training and schools' IT infrastructure. It's as though the Department of Education does not believe world-class ICT provides an essential building block for the delivery of education services. A quality system of education believes that teachers need to be educated on the clever use of technology that students now carry in their backpacks. Some teachers have never stepped up from a clamshell phone, never seeing the need to use a phone for more than talking or texting. To keep phones at bay, some schools force them to hibernate in power-off modes when they could be used as low-cost access points to e-learning materials. When I suggest phones or personal netbooks deserve to be incorporated into a primary schools's ICT strategy I often get confined to the corner of discussions by principals who believe computers belong locked in separate rooms, scheduled when they're updated with the latest anti-virus software. That's so wrong--just as it's wrong to assume that the best way to use State-funded computer assets is to lock them down for most of the year in separate rooms. 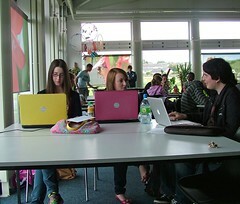 The world has changed--the canteen is the computer lab now (see above). 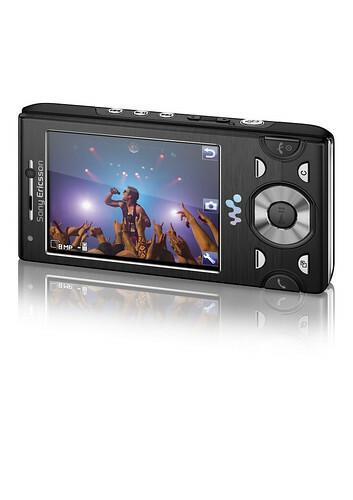 MY LUSTWORTHY BORDEAUX Walkman phone is part of the problem some in the Irish Recorded Music Association feel. Most of the music on the phone's 16 GB removeable memory comes from tracks that landed on the phone from various collections, online subscriptions and Bluetooth exchanges. Since getting my first Walkman device, I've throttled back my purchases of CDs. Along the way, Zavvi, the music retail change formed from Virgin Megastores exited the Irish High Street. I buy five times as much music through online shops than I buy from racks of CDs around Ireland. I wonder how bands are making it. At the bottom end, some bands are getting licensing deals for their music (as little as $2,500 per contract). Getting your track used for a season of CSI means $30,000. Pixar paid Robbie Williams $100,000 to use his swing track in "Finding Nemo" and Feist got nearly a quarter millionm dollars for 1,2,3,4 in an Apple promotional advertisement. At the very top of the pay-off pile are groups like They Might Be Giants who signed for $1m when creating original music for Dunkin Donuts. I'm headed over to iTunes to see if there's something else I want on the Walkman phone. Good new music always sells. ERIC SCHMIDT, CEO OF GOOGLE, visited Killarney last week, and suggested Ireland invest more in communications infrastructure. Schmidt believes broadband capability is a precondition for economic growth in the next 10 years. But not the kind of over-the-air sprinkling that the Irish government currently endorses. Google cannot deliver real-time full-screen rock concerts like U2 in the Rose Bowl if viewers have measly wireless connections like the one shown at left. "The right thing to do is to light up Ireland with fibre, and to do that systematically over a 10-year period." He points to "Singapore, Tokyo and Korea--in Korea's case they have 160 Mbps default penetration. At those speeds, the distinctions between movies, DVDs and the internet go away and are just replaced by a fibre cable and that's the future." John Kennedy -- "Broadband leadership will be a precondition for economic growth" in eThursday, the Irish Independent, 29 Oct 09. 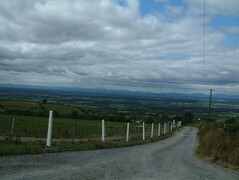 Previously -- "Irish Rural Broadband Hoax" on Inside View, 23 Jan 09. Sample of my home broadband speed tests. HANDHELD LEARNING STARTS before training wheels fit onto our toddler's bicycle and we're using a three-year old Nokia E90 with Peppa Pig playing on its screen. After a few lessons, Mia figured out how to select, start, stop, and pause video clips by the way their thumbnails appeared on the phone. She validated part of the handheld learning experience by showing the importance of good cover art. We ported Peppa Pig and friends to the Nokia E90 using DVD Fab (version 6 as recommended by Barry Doyle) along with a little help from Xilisoft Video Converter. The result: a handheld video player that works SIM-free and in flight mode (no inadvertent calls to emergency services). The five-times-dropped-on-concrete Nokia E90 has effectively started a new life as a handheld learning device. We'll keep the phone parked in the batmobile's centre console where it can trickle charge itself for the rest of eternity and never enter landfill. Get DVD Fab directly from the vendor and avoid spyware sites. Xilisoft is a top-rated video conversion package. Buy it here. AFTER HE RETURNED from Dublin where he saw a billboard that encouraged him to Google for Wimax, a friend of mine asked if I was working for an Irish ISP because my blog appears on the front page of the results for Ireland. I told him I wasn't working for anyone new but that I was happy to handle a boost in website visitors (an extra 85 visitors a day at the moment), thanks to the billboard advertisements. I'd like to point out how Wimax works in rural Ireland but I don't have first-hand experience with it. Moreover, I have my doubts that Wimax would be able to provide me over-the-air broadband strong enough to conduct a videoconference with Online Meeting Rooms and my third level class. That's the kind of test I'd need to perform in order to give readers a quality check of Wimax in rural Ireland. UPDATED 29 OCT to 10,000 tracks after reading Sean O'Grady's comment below. SOMETIME DURING THE U2 Rose Bowl appearance, I notched up 100,000 10,000 tracks listened through Last.fm. Some of those tracks are scrobbled from my iPod as podcasts or tracks I ripped onto the iPod from really old musical collections. Several hundred of those tracks came through my earbuds directly from Last.fm as a result of recommendations of my third level students in Tipperary Institute. I'm shadowing students who want to earn continuous assessment credit for using online social networks such as Last.fm and Blip.fm. Both of those networks serve up hours of quality music. I suggest both Last and Blip because the communities are slightly different and because both the cost-free experience and the exposure to top-flight web developers has proven better for me with Blip.fm. I'm curious if that's validated by students. I'm just scratching the surface with playlists and favorites on both services as well as listening to the RSS feeds generated by Last.fm. When I started into Last.fm in January 2005, I never expected to get free tracks dropped straight onto my iPod by Last.fm but that's what happens every week. I also subscribe to the loved tracks of students, using their hearted selections to build lunchtime listening collections over the canteen sound system. The little graphics on Last.fm tell me that I've "loved" 216 tracks but made only two playlists. I've tagged a lot more music along the way and that's put me into some fun listening zones. Two of my favourites are downtempo radio (thanks, Steffen Coonan) and happy tag radio. Just like the sociologists would predict, the more I explore and the more I tag, the more friends I attract. I expect to have 100 friends on Last.fm before the end of 2009 and to have earned 100 props on Blip.fm by then too. The Blip.fm crowd, a group I've hung with since August 2008, is much more rabid--people like Brian Greene, Dean Whitbread and Josie Fraser have a passion for good music. Sure, I like following them on Twitter but they're actually a lot more fun when sharing their music. Brian and Dean are really good virtual DJs and it's a real treat getting stuck into the middle of their playlists. Brian knows how to make Playstation Portables control Blip.fm just like a radio station and he's pushing stuff into his Blipstream that goes well beyond formulaic playola on the broadcast band. Now it's off to scrape some tracks from my cassette and CD collections, then updating my Blip.fm and Last.fm libraries with some more of my audible fingerprints. ANYONE WHO HAS STRAPPED into an airline seat for more than six hours at a time knows that it's not a good idea to brush their teeth with water coming out of an aircraft's tap. A study of tap water on board 327 American aircraft has found that 15% of the samples tested positive for coliform bacteria. Colifoms are not an essential food group. In the study sample, one in five tap tests failed to detect any chlorine, indicating that the water supplied had not been treated against contamination at all. Speaking from experience, the water supplied to the aircraft's taps could actually have come from a fleet service vehicle, the ones used for latrine servicing, aircraft washing, and anti-icing.The Environmental Protection Agency did the study but did not name the international carriers but the Sunday Times confirms all the carriers involved serve Heathrow or Gatwick. The EPA has ordered all US-registered commercial aircraft to test and disinfect water served from taps in aircraft lavatories. Personally, I would buy bottled water in departure lounges and carry that aboard along with my water purity tester (at left). Katie Bowman -- "Airline tap water not fit for human consumption" in Travel News, The Sunday Times, 25 Oct 09. Sent mail2blog using Nokia E90 O2-Ireland Typepad service while drinking tea in Henry's of Cashel.